14 years ago yesterday, on February 22, 2005, I published my first blog post. I didn’t tell anyone about my blog, but within a couple of days it had been found by the other Unitarian Universalist bloggers. There were maybe 40 explicitly Unitarian Universalist bloggers in 2005. Not many of those people are still writing UU blogs: Scott Wells and Vicky Weinstein are the only ones who come to mind. This has been the most difficult year I’ve had since I started this blog. I developed a pulmonary embolism in mid-February, 2018, which didn’t get diagnosed until mid-April. That illness left me with little energy, and for much of the past twelve months about all I’ve been doing is sleeping and going to work (trust me, a pulmonary embolism is not something you ever want to have). As a result, I haven’t been putting much energy into this blog. Another thing that made it hard for me to write blog posts: the reality of my father’s death finally sank in sometime in the last year. Since 2005, I’ve been writing blog posts primarily with my dad in mind. Mind you, he became incapable of reading in November, 2014 (he died in April, 2016), so the reality is that he hasn’t been reading this blog for nearly three years. Yeah, I know I’m a little slow on the uptake here. But I only recently figured out that I’m no longer sure who it is I’m writing for. An interesting moment in my blogging year came in early August after my post Boomers, step away from the power structure. I heard from a number of UU Millennials that they were so pleased that a Baby Boomer named something that they’ve been seeing for quite some time: that we Baby Boomers are clinging to power within Unitarian Universalism. I also got some very thoughtful replies from Gen-Xers generally agreeing with me, but also offering nuanced critiques. And I also received a number of very vituperative replies from my fellow Boomers telling me what a jerk I was for saying that (and a couple that accused me of being — gasp! — a Millennial); a few Boomers got so out of hand that I had to remove the post and ban a couple of people from ever commenting on this blog again. Deities of non-binary gender, posted in January, is probably going to turn into an ongoing series; I’m curious about the many deities around the world with what we Westerners would call non-binary gender (although other cultures have different terminology), and I want to do some more research on the topic. In Decline, or… I proposed that demographics and finances are the two biggest challenges facing UUism today: money is tight, we’re too damn white; this is a theme I probably be returning to. In October, I posted a retelling of a classic Buddhist story, The Tale of the Dhak Tree, which is better known in the West in the form of the blind men who argue about what an elephant is; this is part of a multi-year series of stories for kids from various religious traditions. September saw a post on Global vs. local atheisms in which I point out that a concept in Indian philosophy has relevance to us today. In July, I outlined the Principles behind Sunday school Ecojustice Class, for anyone thinking of adding ecojustice (which is different from upper middle class environmentalism) to their religious education programs. So happy 14th birthday to this blog. I’m looking forward to another year of long thoughtful posts, along with the usual mix of polemics and fluff and fun. I hope you’ll keep on reading what I write! Samuel Johnson, in a letter to Hester Thrale; quoted by David Nokes in Samuel Johnson: A Life, Henry Holt & Co., 2010, p. 357. I’d like to look at three areas where we face major challenges: finances, jobs, and spiritual matters. Financial challenges first. Back in the 1970s and 1980s, as part of the wave of economic conservatism that swept the United States, employer-managed pensions disappeared and were replaced with 401(k) plans. The Boomer generation, particularly the tail-end Boomers like me, are the ones who are the guinea pigs for this radical experiment in economics. And the experiment, to be quite frank, is going badly. Younger generations, you will want to pay attention to what happens to the Boomers, because you’re stuck in the same flawed retirement system. We like to go to the Foster City Laundromat, and while the laundry is in the machines, we walk across the street, over the levee, and walk along the edge of San Francisco Bay. There’s a great view of the San Mateo bridge to the north, and the Hayward hills on the eastern side of the Bay, but I usually wind up looking at the mudflats, and the long ridge of piled-up seashells making a sort of beach along the edge of the mud. 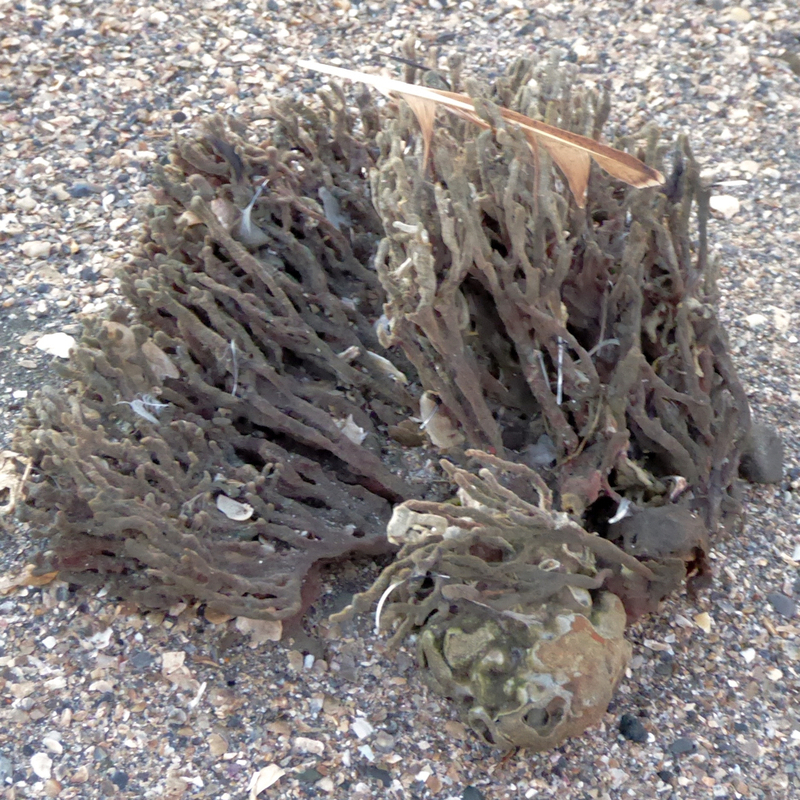 I believe these are Red Beard Sponges, Clathria prolifera, an invasive exotic from the North Atlantic that was first reported in San Francisco Bay in the 1940s, according to the Marine Science Institute in Redwood City. 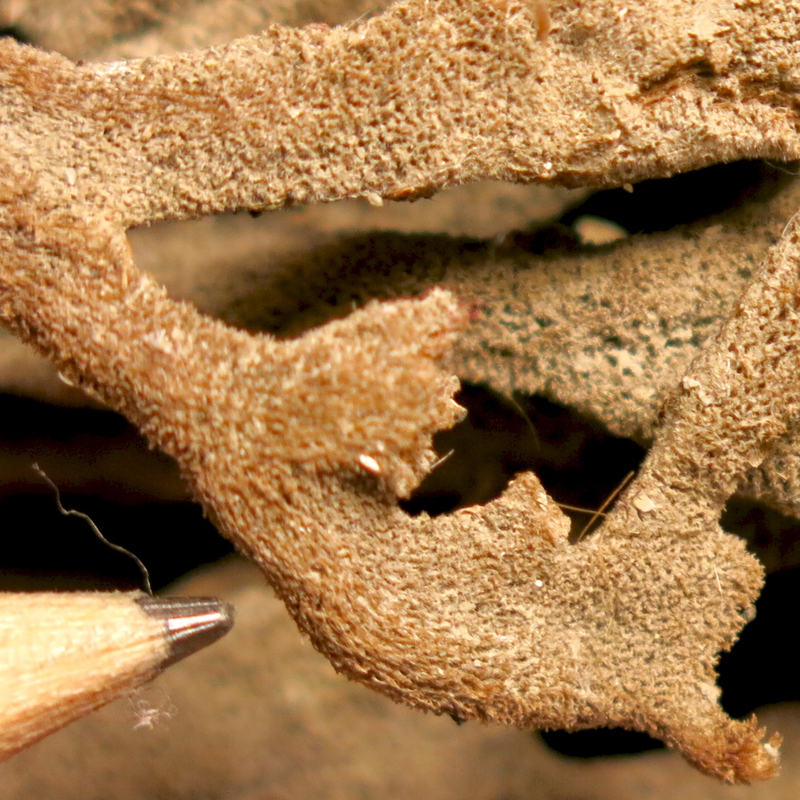 Red Beard Sponges are the only red sponges in our area with finger-like branches, and “when Clathria prolifera dries out … it generally turns brown,” according to Andrew N. Cohen (The Exotics Guide: Non-native Marine Species of the North American Pacific Coast. Center for Research on Aquatic Bioinvasions, Richmond, CA, and San Francisco Estuary Institute, Oakland, CA. Revised September 2011, online here). Because these sponges are invasive exotics, and because the ones washed up on the shore are already dead, I felt it was fine to bring one sample home with me. There I was able to take a reasonably good close-up of the surface of the organism; the porous texture of the organism makes it obvious why this phylum of organisms is called Porifera. I continue to be amazed at the wild diversity of life forms on this planet: Poriferans, animals which don’t have mouths and which remain rooted in place like plants for most of their lives — and Cnidarians like transparent Moon Jellyfish and bright blue Vellela vellela; arthropods from vicious predators like dragonflies to migratory pollinators like Monarch butterflies, crustaceans including large lobsters and tiny sand crabs — molluscs from Banana Slugs to octopuses, several different phyla of worms — and recently I’ve been reading about Bryozoans, or “moss animals,” colonial invertebrates which I’d never heard of before, yet which are apparently quite common and may be mistaken for seaweed. A follow-up post to Illness. I was glad to confirm that I had stopped taking the anti-coagulant on schedule. And I was glad to be no longer taking that drug. Some of the fog cleared out of my head within twelve hours of taking the last pill, and suddenly I only needed nine or ten hours of sleep each night, instead of eleven hours of sleep plus an hour or two nap; I have suddenly gained two or three hours of waking time. It’s a good thing, too, because vacation ended on Sunday, and with the end of vacation I needed all my energy and all my waking hours to go to work and come home and recover enough to go to sleep and get up the next morning to do it all again. It continues to astonish me the extent to which my energy has been sapped by this illness. Yesterday, I started organizing our tiny storage room, something that has never gotten done after we moved in November. I worked away for a couple of hours, and it wasn’t particularly strenuous work, and suddenly I was done. I had to sit down. Part of the problem, Carol pointed out, is that I’ve lost a lot of muscle tone — I just didn’t have the energy to exercise. I lost five or ten pounds, and it’s not like I had a lot of extra body mass before I got ill.
Mostly I’m writing this to remind myself that I have indeed been ill — not really ill, it’s not like I had cancer or major surgery — but ill enough to affect most aspects of life, ill enough that it’s going to take a long time to get back to normal. Oddly enough, I don’t feel this illness is a waste of time. I certainly have lost a lot of time to sleep and lack of energy. But it has been good to slow down. I tend to work fifty or so hours at my job, and another ten or twenty on projects that relate to work but that aren’t part of my actual job, and then another ten or twenty hours on hobbies and volunteer activities that sometimes feel like jobs. Because I cut back on everything, and because I haven’t had a lot of energy, I actually have had time to sit out in our tiny little back yard and just stare into space. It’s been a very long time since I spent any amount of time doing nothing, and it turns out to be quite enjoyable. While I can’t recommend developing a pulmonary embolism, I certainly can recommend doing nothing. …and the “o”s in the poem graphically convey what the moon does from the time it first rises to the time when it is overhead: it appears to grow smaller. We were driving home as dusk turned into night, and Carol looked into the rear view mirror and said, “Look at the moon! It’s huge!” It had just appeared over the horizon. She wondered aloud, Why did the moon look so huge? Why did it get smaller? I explained the optical illusion that makes the moon look big on the horizon. “If you hold out a piece of cardboard at arm’s length and put two marks on it showing how wide the moon is — and then hold that same piece of cardboard out at arm’s length when the moon is overhead and looks so small — you can see it’s exactly the same size all the time, even though it looks so much bigger near the horizon.” I actually did just that many years ago; even though I knew, intellectually, what was going to happen, it was astonishing. Carol said that explanation takes all the magic out of it. But I disagree. How amazing that we see the world in that way! How amazing that there is more than one way to see the world! When we got home, we walked out into the cemetery and watched the moon rise further into the sky, moving slowly up between two dark clumps of eucalyptus, just touching the point of a smaller Douglas-fir tree. You could see the distance between the Douglas-fir and the moon slowly grow greater. You could see Mare Ibrium and Oceanus Procellarum and Mare Fecuditatis and Mare Nectaris; you could also see the Rabbit in the Moon, grinding with its mortar and pestle; you could also see the Man in the Moon, with his lopsided grin. You could see the night grow darker and the moon grow brighter. Everything changed in a quarter of an hour. We stayed outside watching until it grew too chilly. …with the assumption implicit in the story that society needs what you’re good for…. Back in mid-February, during a long drive up to Seattle, a blood clot formed in my leg, dislodged, and traveled up my veins to settle in my right lung. Or so it now appears, for this is somewhat hypothetical. But it was a long drive, and we didn’t get out and stretch every hour, as you’re supposed to do during long drives; and when I got to Seattle, I started coughing, and thought to myself how unfair it was that I was getting bronchitis again, since I had already had it in November and I never got bronchitis more than once a winter. Thinking it was bronchitis, I didn’t worry when the cough and the general feeling of being tired stretched out for a month, then two months. So many people were having serious respiratory infections this past winter that what I was experiencing didn’t seem all that bad. Until finally it got so that it hurt to breath, and I was talking to Paul, who was also having pain while breathing, and he told me that he went to the doctor and found out that what he had wasn’t a respiratory infection at all. It was only then, in mid-April, that I decided to go to the doctor, and after a series of tests and a trip to the emergency room, I learned I had a pulmonary embolism. Mine was not a particularly serious case — I did not require surgery, and I didn’t even have to stay overnight in the hospital — but still, a pulmonary embolism can kill you. I actually took two days off from work. The doctors put me on a course of anti-coagulants: I had to inject myself with one anti-coagulant for seven days, and then I started taking another anti-coagulant orally twice daily. I am still taking the pills, and will continue taking them until the doctor tells me to stop. And by the way, I thanked Paul, several times, for prompting me to finally go to the doctor. Now that I had this diagnosis — a rather frightening diagnosis, if truth be told — I began to realize just how tired I felt. I had been pushing myself as hard as usual, both at work and in the rest of my life, but now I realized that I really couldn’t push that hard. (I wonder: had I not gotten the diagnosis, would I have just continued pushing myself until I collapsed?) I finally realized that I needed to slow down. I dropped several big commitments, including a big family reunion, and felt some guilt and shame for doing so. Then I dropped some smaller commitments. I worked at home whenever I could. I discovered that I needed to sleep ten to twelve hours a night, and still take a 3 hour nap in the afternoon most days. Basically I felt fine; but if I pushed too hard, or worked too long, I would become exhausted very quickly. This was an odd sort of illness: no pain, no real symptoms aside from some shortness of breath; I was mostly tired. Thinking that once I started the anti-coagulants, I would be back to normal in a week or two, I told as few people as possible that I was ill, or what my illness was. But I did not recover very quickly. I had to get used to sleeping twelve hours a day, and not having enough energy to do any housework. in fact, once I came home from work I didn’t have much energy to do much more than sit and look out the window. It also began to sink in that I could have died. I had made my peace with dying many years ago, but I discovered that I was not so keen on dying of something I had never heard of before. I mean, a heart attack I could accept, but a pulmonary embolism? So I mostly ignored the whole “I coulda died!” thing; sometimes denial is a very useful tool for living. Here I am, more than four months after this whole thing started, more than two months after I got a diagnosis. I’m getting better, and so far the doctor is pleased with my progress. But if I forget myself, and overwork, or go for a long walk, or do too much of anything, I’m exhausted for days afterwards. And while the line on the graph of my health is generally trending upwards, the slope of the graph is not nearly as steep as I would like. I have to remember how little I can accomplish: I can go to work, come home, and sleep; if I’m lucky, I can take a walk. It would be easy to become discouraged, or to get depressed; instead, I’m mostly able to enjoy this forced vacation. The moral of the story? I don’t think there is a moral to this story. Things happen to you, you do the best you can — that’s not a moral. Nor will this even be a story until it comes to an end, and who knows when that will be. No moral, but I do have some excuses: If I haven’t gotten back to you about something, it’s because I ran out of energy. If I haven’t done whatever it is you asked me to do, it might be because I’m so tired I forgot completely (my memory does not seem to be functioning as well as usual). That’s one very small benefit of an illness like this: I have an excuse for almost everything. Isaac Asimov, The Noble Gases, New York: Basic Books, 1966, p. 157. Richard J. Bernstein, “John Dewey on Democracy” (Philosophical Profiles, Univ. of Penna. Press, 1986, pp. 266-7).